My name is Elizabeth Howell. I am a Space journalist. I am proud of being invited to attend shuttle launch STS-129 at the Kennedy Space Center in 2009. I enjoyed the experience so much I went back there two more times. 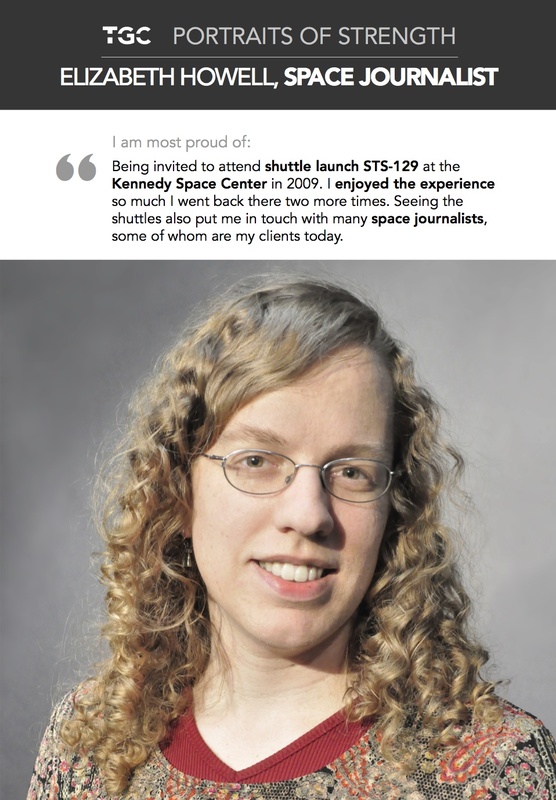 Seeing the shuttles also put me in touch with many space journalists, some of whom are my clients today. The biggest obstacle I have faced was early in my career a lot of newspapers and journalism websites were losing money and laying off journalists, so I had to figure out how to stay employed for more than six months at a time! My advice to women is find something that interests you and write about it any way that you can. Maybe you won’t get a full-time job out of it, but you will meet interesting people and have the chance, potentially, to travel or go to conferences or get other opportunities. And have fun. Try always to have fun. Twitter | LinkedIn | Google+ | www.